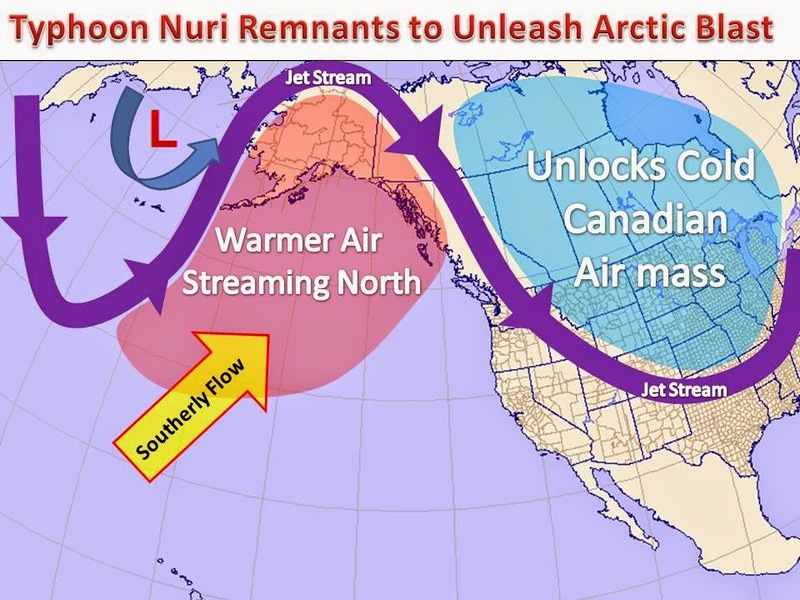 The remnants of Typhoon Nuri will have a major impact on the overall pattern in the United States next week. The cyclone passing west of the Aleutian Islands is forecasted to reach a mean sea level pressure of near 920mb, a would be record in the Northern Pacific! Damaging winds and waves in excess of 50' will be the norm across the area over the next few days as this powerful system drifts off to the north and east. Cyclonic winds around the center of the system will usher in warm Central Pacific air into Alaska over the next several days as this southerly flow hold its ground. In turn, the jet stream will be bumped north and an amplification in the jet steam will occur in the Northern Hemisphere. With a massive ridge over Alaska, a substantial trough will then result over much of the United States. This feature will allow the otherwise locked up Canadian air mass to dive southward by the middle of next week. The colder air will begin to push into the United States by Monday and Tuesday, with the furthest extent of the arctic blast coming in on Thursday. For a detailed description of the cold Click Here!. While Alaska will see well above normal high temperatures, the Midwest will see temperatures on par with those of mid January. The CPC agrees, here is there 6-10 temperature outlook, on right.